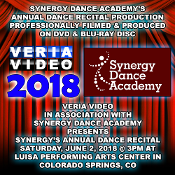 Veria Video In Association With Synergy Dance Academy presents the studio's annual dance recital production held on Saturday, June 2, 2018, 3PM at Luisa Performing Arts Center in Colorado Springs, CO. Professionally filmed in High Definition and available on both Standard Definition DVD & High Definition Blu-ray Disc. All orders will be delivered to Synergy Dance Academy studio for pickup unless you select the “Mail it to me!” shipping option ($5) during checkout, upon which we will ship your order to your provided address. Estimated time of completion / delivery is 4 weeks after filming of event. Digital Copy (if ordered) will be sent via e-mail notification for download prior to official video release.